In 1994, I began teaching my children to memorize the Word of God in creative ways. Naturally, what we had been doing at home just spilled into VBS, Sunday School, Caravan classes, Children's Church, home school groups and even Bible Quizzing. My children and I began to lead workshops teaching others what God had shown to us. The impact it has had on the children around us has been nothing short of amazing. I have seen "tough" kids, usually boys, who stand in the back, arms crossed, saying with their faces, "There is NO WAY I'm going to memorize ANYTHING!" having the time of their lives and asking for more. Instead of "Do I have to? ", Bible memorization has not only become enjoyable but many times the favorite activity at an event. Isn't God GREAT?! With His guidance and creativity, I have seen children as young as 3 years old memorize entire BOOKS of the Bible. Praise the Lord! And they remember it!!! - Even the references!! Well, who am I? My name is DaVonne Lee. 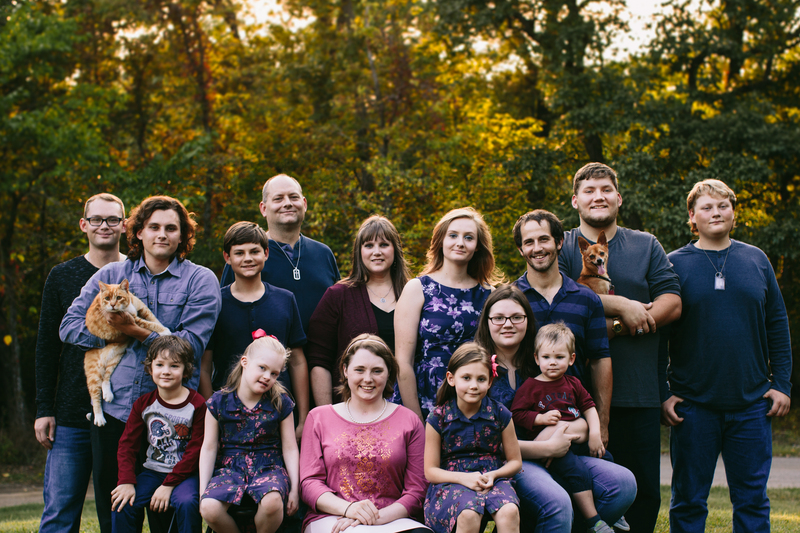 I am wife to Cameron Lee and mother to 17 wonderful children; Five live in heaven with Jesus, and we have home schooled the remaining 12 who have been left in our care (Brittlyn, Berrick, Bryce, Blake, Brandon, Bradly, Bowen, Brynn, Bella, Brayah, Braven, and Bodhi. Before attending Mid-America Nazarene College and traveling in their PR groups for two years, I sang with Continental Singers traveling across America twice then to Holland, France, Belgium and Germany. In February of 2002, I joined the staff of Westside Church of the Nazarene serving as their Worship Arts Ministry Leader leading the Children's Bible Study and Quizzing Program. When available, we lead workshops to demonstrate creative ways we have learned to Hide God's Word and Keep it there - thus our ministry name: Hide & Keep! Our lives changed quite a bit in 2007; Our little Bella, born 07/08/07; was diagnosed with Down Syndrome shortly after entering this world. That was a quite a shock for us, but she was also born with three holes in her heart! She had open heart surgery March 11th, 2008 to correct these holes and she has had an amazing recovery! In April, 2013, Bella was dually diagnosed with ASD (Autism Spectrum Disorder). You can read more about Miss Bella and her journey by going to www.caringbridge.org/visit/bellalee. November 7, 2014, our oldest daughter was involved in a terrible car accident resulting in a very broken body and a severe Traumatic Brain Injury (TBI). That life changing moment has forced us to find yet another "new normal". Due to the extent of her brain injury, Brittlyn was never expected to wake up and yet God has done a miracle in her life! Brittlyn is the illustrator for our coloring books, thus the reason we only have Genesis and Exodus. You can see her in any of our DVDs previous to 2015 and can follow her journey on Facebook at Brittlyn Lee's Journey. If you have a child with special needs and you want to share your story with us, please do! We would LOVE to hear it. Copyright © Hide & Keep. All Rights Reserved.